The last day of twenty fourteen! I thought it was only appropriate to look back on where I was, where I’ve come and what I have before me. Last year I posted a litany of resolutions, or what I called Purposeful Intent. Something that I intended to do with purpose. While I did some of the things on my list, I failed completely at others. Instead of a list that will just show me how futile human attainment (for me at least) can be, I opt in instead for a word to focus on, and a verse to pray over. I’m also in the process of writing down A Thousand Gifts – things I love to show me how I’ve been blessed and loved by the Lord, and of course my trip to the BWCAW. Way back in 2013 I had chosen a verse for the year to focus on. I wrote it out on scratch paper in pen, and taped it to my electronic calendar which was Proverbs 19:21 – Many are the plans in a person’s heart,but it is the Lord’s purpose that prevails. Each day since, I’ve looked at that verse and repeated it to myself. This verse gave me such a great deal of comfort while we waited to find out if our daughter was going to get into the school we desperately had hoped for, and in the aftermath of my dad. This past summer while my father was still clinging to life in the hospital Proverbs 3:5 just would not leave my mind. Trust in the Lord with all your heart and lean not on your own understanding. This was my mantra – and still is. There is no way for me to understand what happened, and all I can do is trust fully in the Lord and know that this is not the end of the story. After hearing this amazing song by none other than Hillsong United (Who brought us Oceans) I could not get the word ANCHOR out of my mind. In fact I almost named this blog – littleblessedlife.com with something to do with an anchor. It seemed so powerful with both me and my dad having served in the Navy and then with this overwhelming desire to go to the BWCAW this upcoming spring I knew that this word was going to be it for 2015. 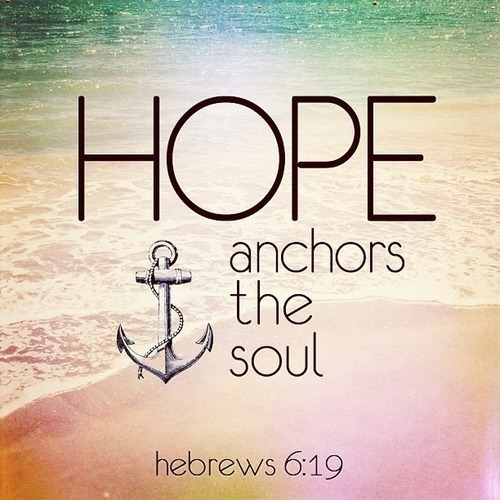 It wasn’t until I started looking for a stock photo of an anchor for this exact post that I came across Hebrews 6:19 and my jaw dropped to the floor. The lyrics of this song which will not get out of my head was ripped right from Hebrews 6:19. Oh how I believe in this verse with my entire being, my entire soul! When I came across this song late this fall, the lyrics immediately gave words and real structure to what I had been feeling in my heart these past few months, but could not say myself. It felt deeply like my postlude to Oceans in a way and to my story. I had been led out into the deep waters, walked on water and am now holding so tightly to my Anchor, my God to keep me from blowing away. I find it difficult at times to explain what I am feeling inside, but this song and its lyrics do it so beautifully. On any given day when I felt the tides rise up, ready to wash over me I listen to this song with arms stretched out and face lifted, and immediately feel the Lords presence surrounding me. Its strange in a way to me how deep my faith has grown since July. Its not as though I grew up with unbelief. From as long as I can remember I believed in the story of the cross, but some how I now just know its true. Every time I sing to God, and pray I feel my dad right next to me. In these storms it is so easy to drift, and be consumed with the rains beating down on you – but with the Anchor holding me in place I will not drift, I will not fall I will not be consumed with fear and despair, but consumed with faith, hope and love. Love that was nailed to the cross. My Father has been so present in my life these past six months, its overwhelming to the point of tears when singing worship songs. I can’t imagine how my father feels being face to face with Him. “He gave everything to save the world He loves”. Hope. What brings joy to the heart, which brings light to the world, and the laying out of full trust in the Lord. Drink in these words with me. Let them wash over you, and I wish you each a blessed and remarkable 2015 where you grow closer to the Lord. These words are my anthem, my battle cry. I am such a sucker for acoustic versions of songs- so when i found this there was so much joy and elation in my heart! I hope you enjoy! LA • This entry was posted in Faith, Thoughts & Feelings and tagged Anchor, bereavement, Christian, Christian Blog, Cross, dad, death, father, God, grief, Hard Times, Healing, Heaven, Hebrews 6:19, Hillsong, hope, Jesus, loss, Love, Storms. Bookmark the permalink. Thank you Anne! That means so much!